We have a dream of transforming our previously gravel yard into a desert oasis with an edible forest and native pollinators irrigated with rainwater. We have a long way to go. Just making our landscape as water efficient and sustainable as possible is an experimental process. It all started by observing where our water was puddling during our magnificent monsoons. First, we made some small changes such as removing a few bricks at the end of the patio to allow it to drain into our hummingbird trumpets. And it worked beautifully! No more mosquito breeding pool! And our hummingbird trumpets perked right up! 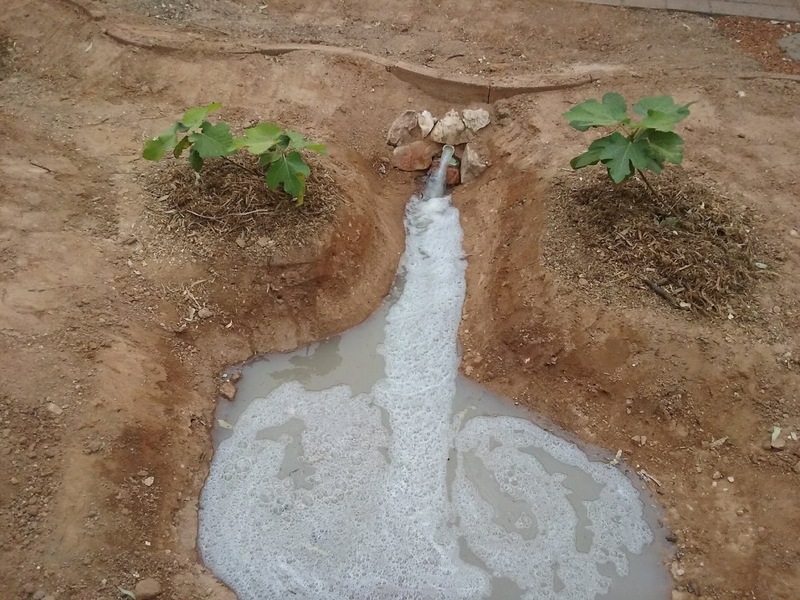 That success led to other simple adaptations like using the gutters to direct roof water into our kitchen garden. Our kitchen garden is a little experiment in growing food using just what the desert provides to naturally nourish the soil (like compost and palo verde mulch.) 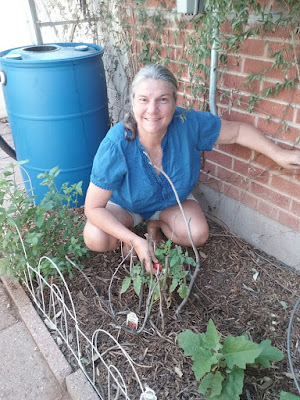 It took 3 gallons of water a day for a few herbs and a couple of tomato plants. So we started supplementing that with kitchen rinse water. 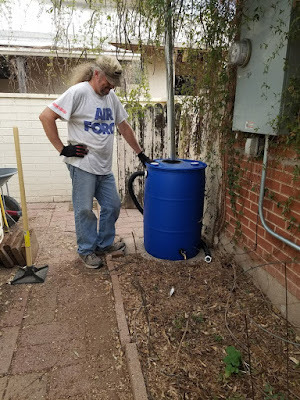 Ever the optimist, Dan installed a couple of water barrels to collect more rainwater. 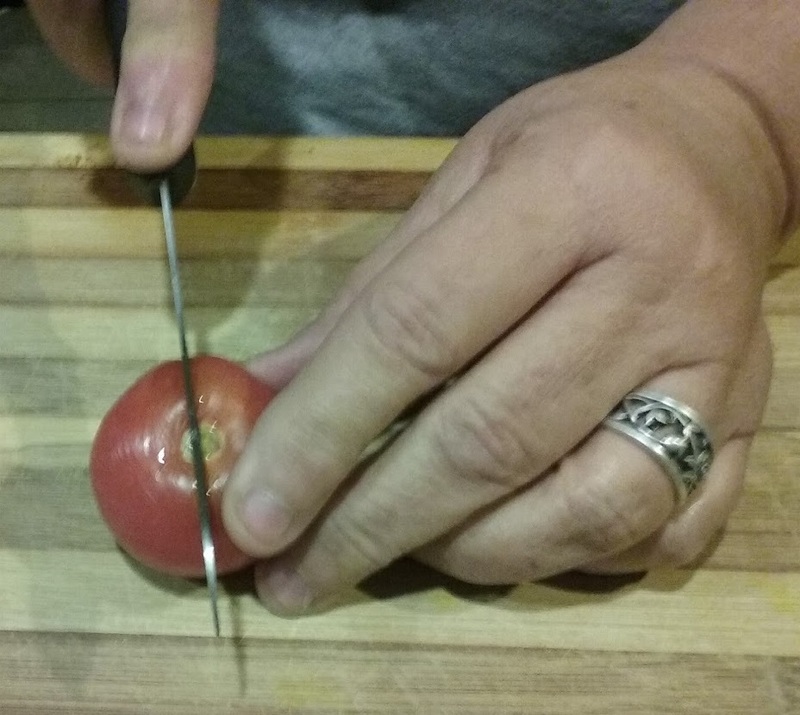 All for a tomato! Dan dug up all the gravel in the front yard so the rainwater would sink into the ground instead of flowing out to the street to evaporate. (We still need to add some organic mulch. It works with the roots of native grasses to form a sponge that allows the rainwater to seep into the ground and hold the moisture longer. This is what Brad Lancaster calls "planting the rain.") We would use that water to irrigate an edible forest of native plants: broadleaf hackberry. sweet acacia (behind ocotillo), wolf berry (in basin), desert hackberry (in foreground), and velvet mesquite. Don't know how much human food we'll get from them, but they are great pollinators. We watered them until they were established and then waited for the rain. And waited... Would it ever rain? 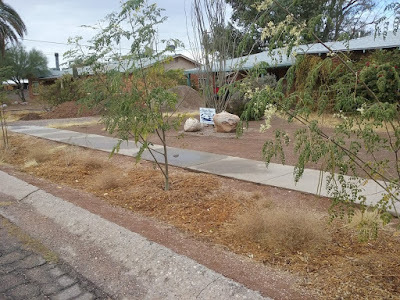 We needed something really drought tolerant that we could eat, so we decided to plant moringa in our street side basin. Moringa leaves, flowers, and pods are all edible and highly nutritious - and not just for wildlife. 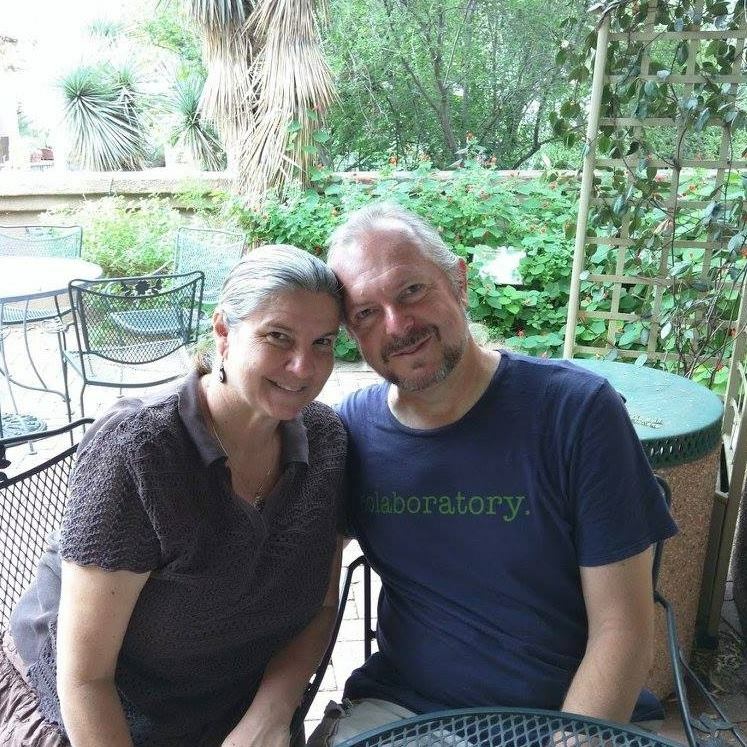 We sowed the moringa seeds in June so they would be well established by monsoon season. 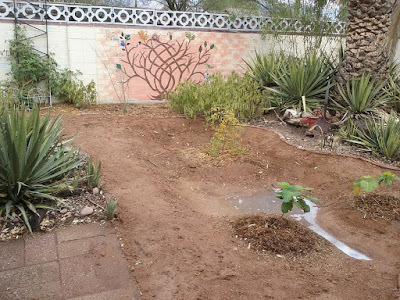 It took about a gallon of water a day to get them started until the monsoon rains finally took over. The incredible thing is that the moringa continued to grow after the monsoons ended even though we weren't watering them! They still have flowers and pods! Gonga! Now we're watching to see what they do in the first frost. 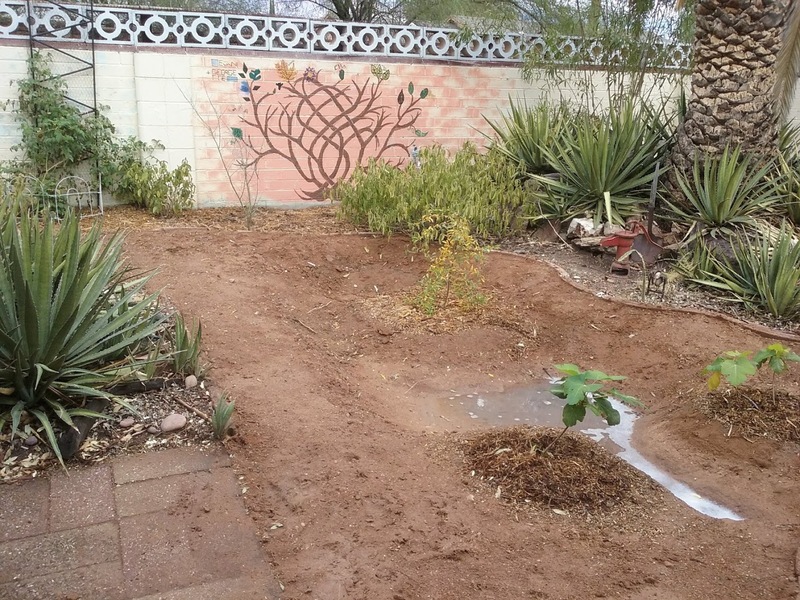 In our backyard, we planted another edible forest of Kino fig and pomegranate trees. (See pic at top of page.) 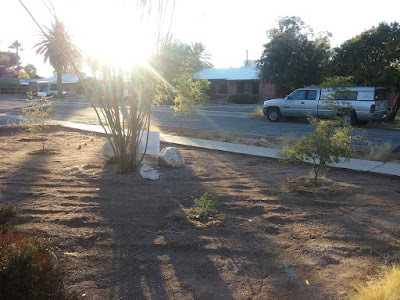 We chose these heritage trees because they have adapted to the desert. Twice a week we slow watered them using a five gallon bucket with two small holes. Dan finally found the time to dig out a catchment basin around the fruit trees and to install a laundry to landscape system to irrigate them. "Celebrate good times! Oh, yeah!" He still needs to shape it a bit and fill it up with organic mulch. (The mulch holds the moisture and releases nutrients as it breaks down.) He managed to get it installed just in time for the winter rains! What's next? It's back to shaping the front yard basin and filling it with a truck load of mulch. There's so much more we want to do when we have the time and money. A chicken coop by the big garden... Our friendly neighbor has offered to let us connect a cistern to the gutter on his roof to water our that garden! It's all a process!